Hertfordshire will be hosting many fireworks displays for 2018. This is your Fawkes guide to all the local events taking place this Bonfire Night. If it’s hot food, chilly nights or just a good old-friendship, you will find a fun night, for yourself and everyone in your group. To make it easy, we have added a Table of Contents – So you can quickly navigate to your local Hertfordshire area. We have also added a change log, If at any point we take away or add an event, it will appear in that section. Time: Gates at 6 pm, display at 7.30pm. Venue: Cathedral and Abbey Church of St Alban, AL1 1BY. What’s on Fireworks, Food Village, Hot and cold drinks, Bar. Price: Under-3, Free, Under-16s, £3, Adults £7, Family, £14, (until midnight on Friday 2nd November). Cash only, after 6 pm, 3rd November, Under-3, Free, Under-16s, £5, Adults £10, Family, £20. Learn More: View Here about St Albans Cathedral Fireworks event. Time: Gates at 5 pm, display at 7 pm. Venue: Hitchin Priory, Tilehouse St, Hitchin, SG5 2DL. What’s on Food, Fireworks, Good Fun. Price: Online sales of early-bird – tickets will be available soon. Tickets will be available on the gate. Learn More: View Here about Hitchin Fireworks event. Time: Gates at 5.30 pm, bonfire lit at 6.30 pm, display at 7 pm. Time: Gates at 5 pm with last entry 6.30 pm, display at 7 pm. Venue: Angerland Park and Ride, South way, Hatfield. What’s on 20-minute display, fun fair and food vendors. Price: Adult £5, under 12s free. Learn More: View Here about Hatfield Fireworks event. Venue: Woolston Manor Golf & Country Club, Abridge Road, IG7 6BX, Chigwell. What’s on Delicious food stands, live entertainment and a firework frenzy. Price: Tickets · On sale on 1 October at 11:00. Learn More: View Here about Friday Fireworks Frenzy event. Venue: Silver Leys, Hadham Road, Bishop’s Stortford, CM23 2QE. What’s on Fireworks, great atmosphere, Drinks. Price: Details on how to obtain tickets will be released shortly. Learn More: View Here about Bishops Stortford RFC event. Time: Gates Entertainment at 6 pm, bonfire at 7 pm, display at 7.30 pm. Venue: Gade Ave, Watford, WD18 7LG. What’s on: Variety of food and drink outlets, kiddies funfair rides and bungee trampolines. Learn More: View Here about Cassiobury Fireworks event. Time: Gates at 5.30 pm. Venue: Tring Park Cricket Club, Tring. What’s on Cricket, Hockey, Youth Football, Lacrosse, Running, much more. Price: F, £15.00, A, £7.00, C, £5.00. Learn More: View Here about Tring Festival of Fire event. Time: Gates at 5.30 pm, 18:00–21:00. Venue: Crabtree Lane, Harpenden, Herts, AL5 5PU. What’s on Fireworks, Fun, Food, Drinks. Price: Tickets available closer to the date. Learn More: View Here about Crabtree Fireworks Spectacular event. Time: Gates at 4.30 pm, display at 5.30 pm. Venue: 11 Nurseries Rd, Wheathampstead, St Albans, AL4 8TP. What’s on BBQ food, hot and cold drinks and glow toys. Price: Adult £5, Children £3 & Under 3’s FREE. Learn More: View Here about Wheathampstead Fireworks event. Venue: Aldenham Rd, Bushey, WD23 2TR. What’s on Funfair, Food & Drinks available. Price: TBA CLOSER TO DATE. Learn More: View Here about Bushey Annual Fireworks event. For a safe fun night at any of these Hertfordshire Fireworks Displays Round Up 2018, Please follow the rules, as most displays do not allow to sell or buy fireworks or allow animals. Please take extra care if you are attending on your own, take the extra money and a mobile phone for emergencies only. Did you enjoy this post? Please share it with your friends. Would you like more? 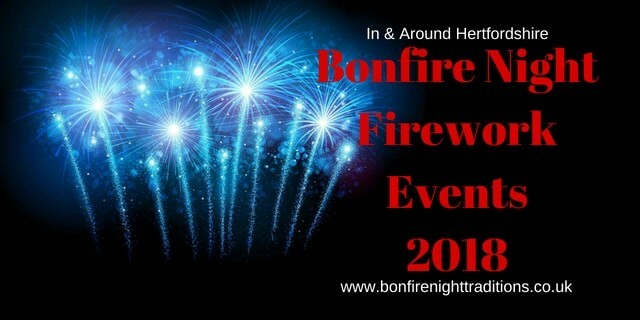 join us at the Bonfire Night Firework Displays in Hertfordshire Facebook group. Where all the latest Hertfordshire events are happening. Removed – 1 event – 07/09/2018 – 10:23 am.